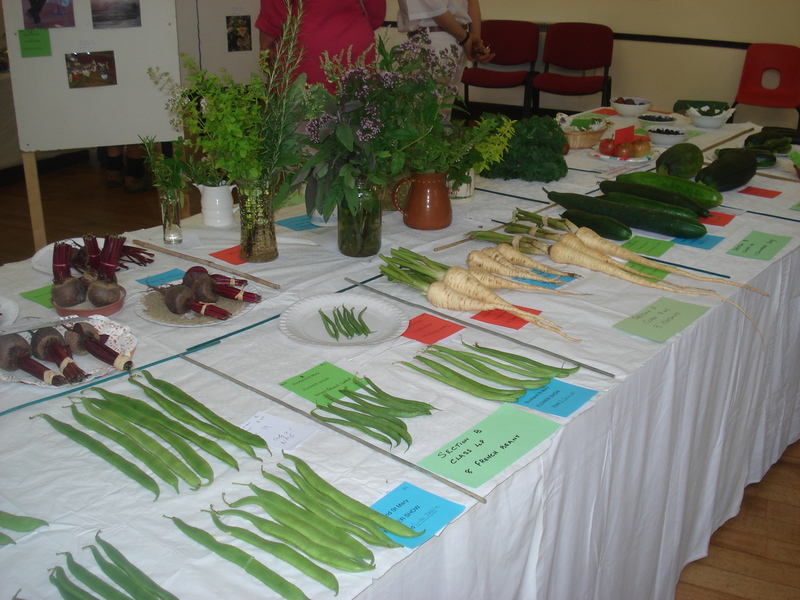 Today was the annual flower and vegetable show in the local village hall. I entered just 6 categories this year as I knew I couldn’t get down there on Sunday morning to put in perishable items as I would be serving breakfast to our guests. The show was very well attended and I saw lots of my friends there and I had a cup of tea and a lovely piece of carrot cake whilst waiting for the prize giving. I got two 2nds, one 3rd and two “highly recommended” so not bad for only 6 entries. 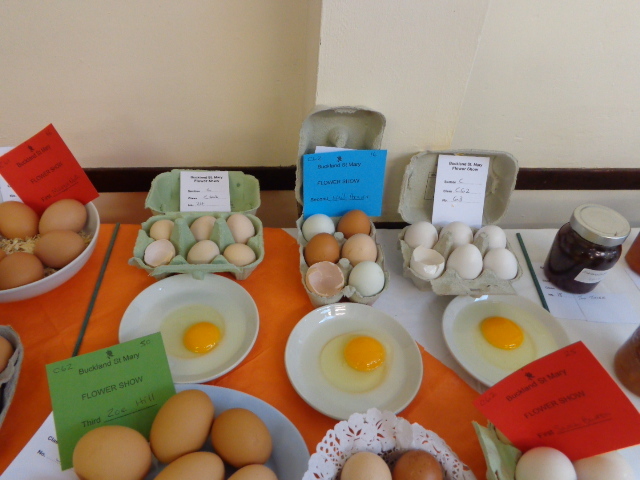 I was miffed our eggs only got a 3rd, I really think they should have been a 1st as they had the deepest yellow yolks. But it’s nice to think my Blackberry jam and my Marmalade are up to standard, certainly our guests seem to think so. I only managed to print 2 pictures of my container garden instead of 3 as the 3rd file was corrupted so I got a 2nd for that. And a Highly Recommended for my piggies down on the farm. All in all it was a good turnout and a bit of fun entering various categories. Here’s to next year and a few more entries. 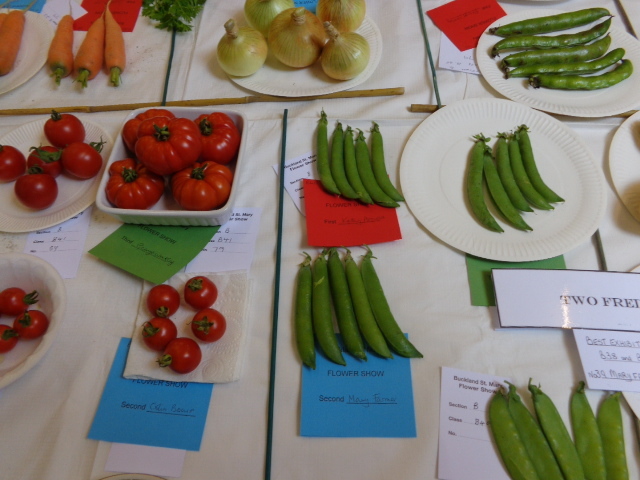 Yesterday (Sunday) was the day of the annual Buckland St Mary Flower and vegetable show. It’s always good fun and categories are hotly contested, but all the money raised goes to charity. This year it was the Dorset and Somerset Air Ambulance. We entered several categories and won a few prizes. I got a first for my peas in a pod. That’s the red ticket. And a second for my lovely blueberries. that’s a blue ticket. Neil got a second place for his potatoes. And a second for our eggs. 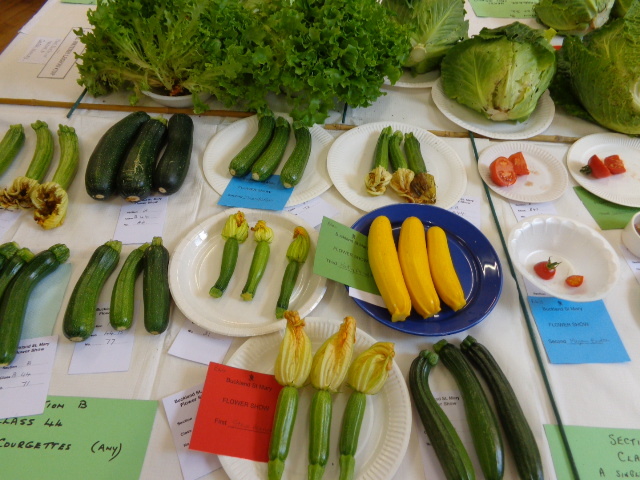 I got a third place for my lovely yellow courgettes, that’s a green ticket. Altogether we got, one first place, three second places and eight third places. We got third place for Neil’s Blackberry wine, my strawberry cordial, my strawberry and red gooseberry jam and two of my photos. 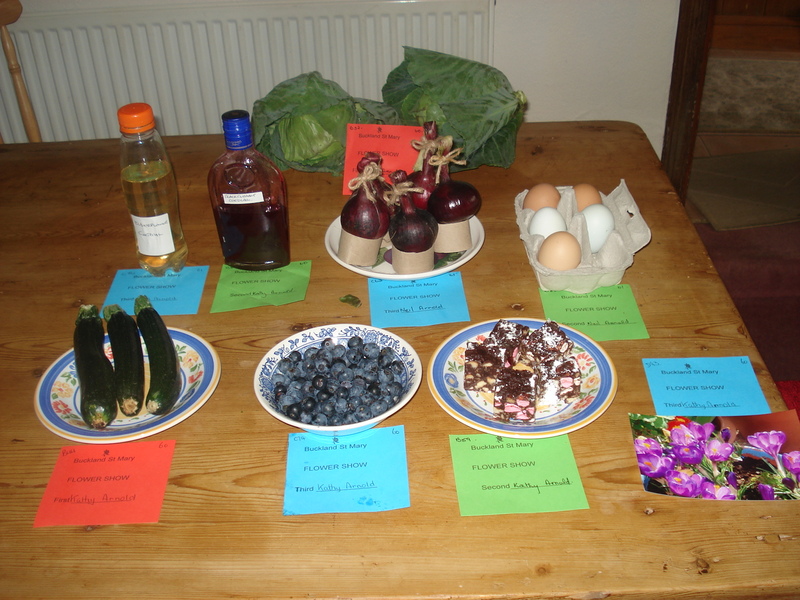 When we came home we put all our winning exhibits on the table and took a photo. We saw lots of our friends at the show, and were comparing notes on who had entered and won what. We also had afternoon tea and cake there, so a very enjoyable afternoon all round. 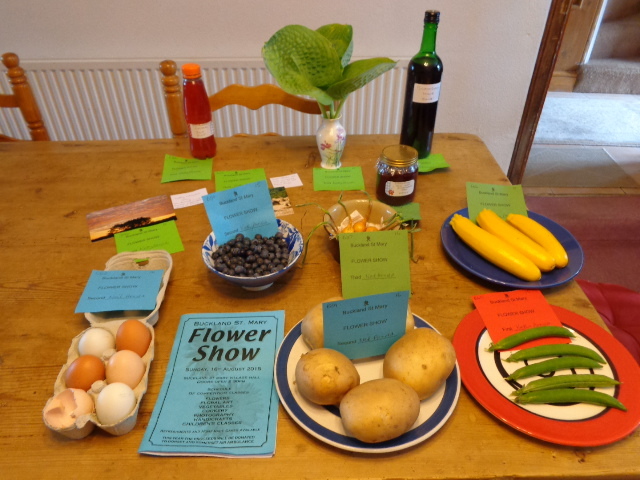 We showed our B&B guests our exhibits and told them they could have prize winning eggs and jam with their breakfast this morning!! 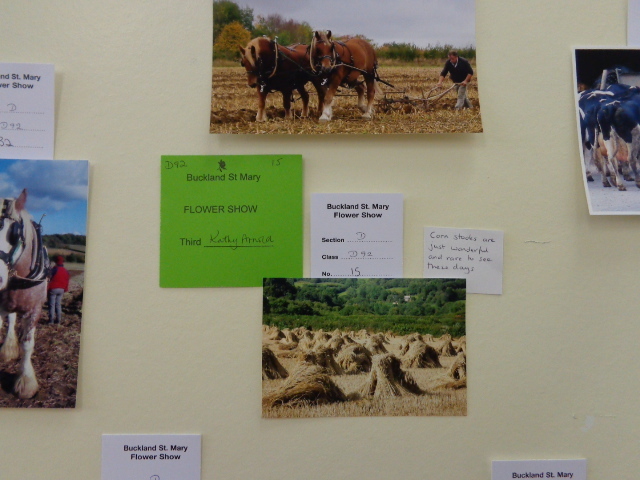 Today was the annual Buckland St Mary flower show. It’s not just flowers, but vegetables, cakes, eggs, photos, jams etc. We entered a few categories for a bit of fun, not taking it too seriously, although some people do. It’s very competitive. The money raised from entry fees etc is going to the Chard Hospital League of Friends, so a good cause. 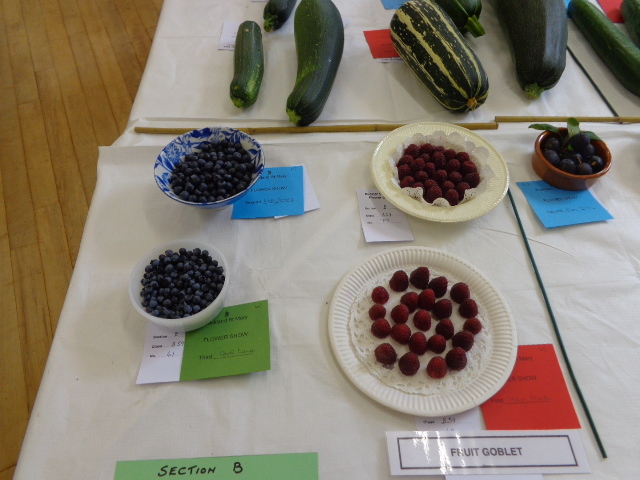 Anyway, we took our exhibits in early this morning and went back this afternoon to see the results of the judging. A red card is first prize, a green one second and a blue one third. 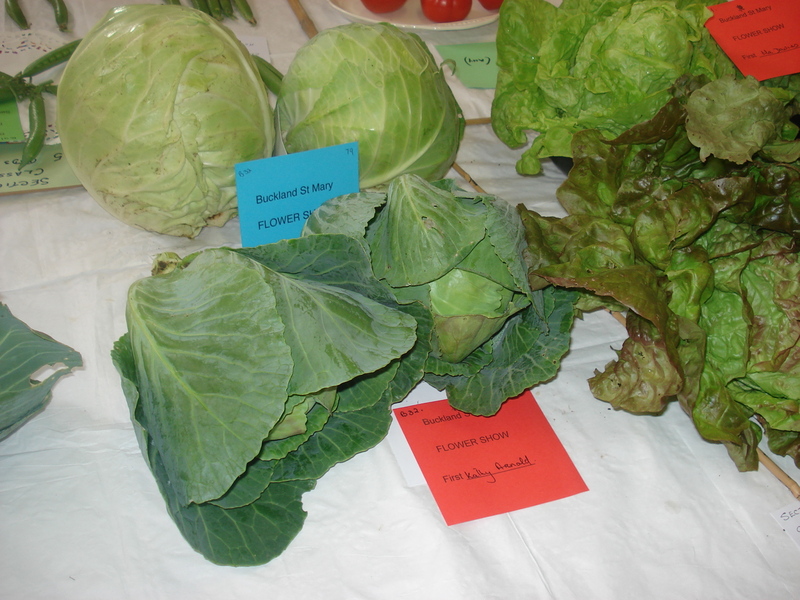 My cabbages won a first prize, which was a bit of a surprise. Of course I never normally pick 2 cabbages at once, there being only 2 of us to eat it, but luckily we have friends coming for dinner tomorrow night, so I can use them up. 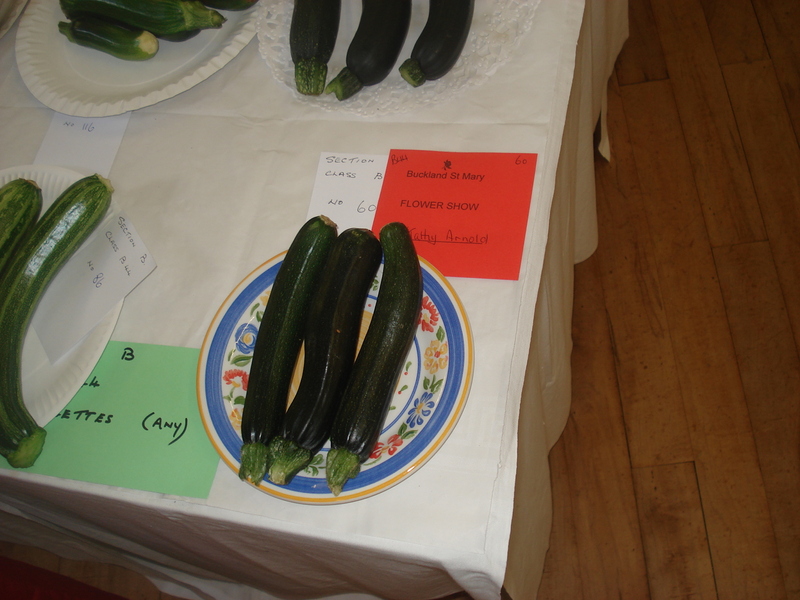 I also won first for my courgettes. I picked about 8 courgettes including some yellow ones and put these 3 in because they were roughly the same size, so that obviously worked. 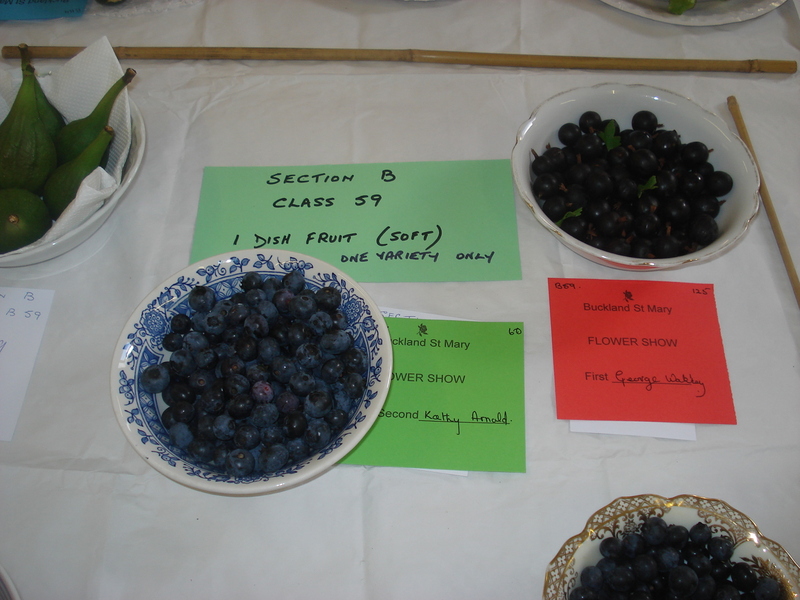 My blueberries won a second, should have been better than that, our blueberries are gorgeous!! 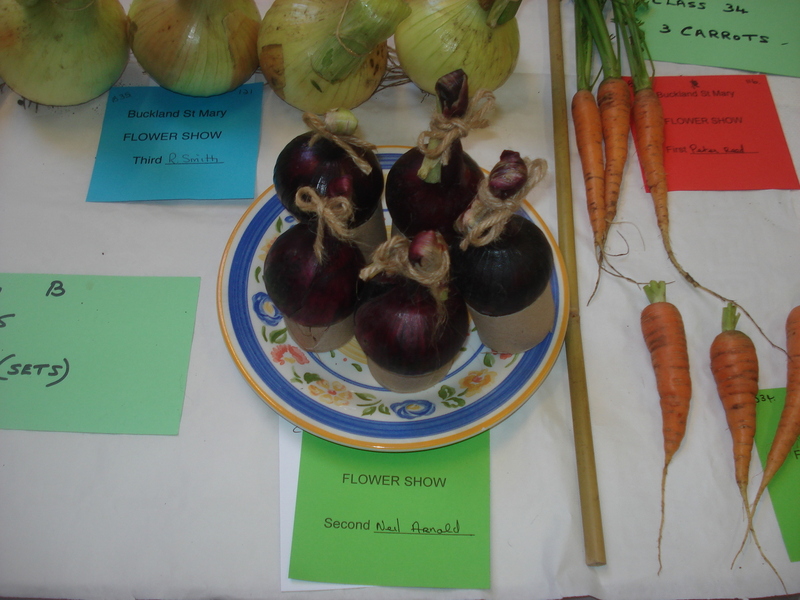 Neil got a second for his onions, which was really good as we have never grown red onions before. 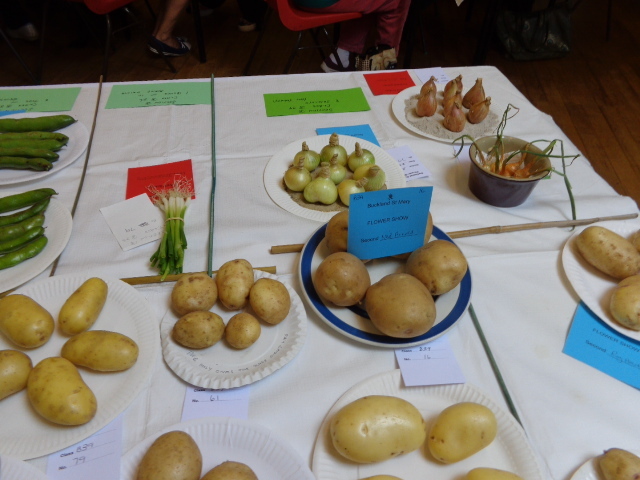 Last year his onions were not placed but he won a first for potatoes, but this year his potatoes did not win. Overall we came away with 9 wins, so we reckon we did quite well. When we got home I laid out all our prize winning products and here is a picture of them all, including a photo that got a third.